What do you do as a leader when you want to see your group members grow and yet they seem reluctant, resistant, or even rancorous toward making a commitment to grow spiritually? I remember a conversation I had with Bob, a small group leader at our church. Bob has a very intimate relationship with Christ that exudes from him. He told me about his frustrations with some of his group members who are not committed in their relationships with Christ. As Bob shared this with me, tears welled up in his eyes. Bob wants so much more for them, and his heart aches that they don’t seem committed to Christ or growing in their relationships with him. My friend Murphy Belding always says the only person we can disciple is a willing one. Wise words. As leaders, we must trust God to do what only God can do in a person’s life. That means I will be praying for that person constantly. I will invest into his life. I will encourage. I will offer to disciple him. I will ask if he’d like accountability for what he commits to. But I cannot make him do it. I do not want to make this commitment legalistic. Jesus does not force his way into our lives to make us grow. He stands at the door and knocks (Revelation 3:20. This passage is often used evangelistically—Jesus is knocking on the door of a lost person’s heart, inviting him to accept Jesus as Savior. But this passage is written to the church, to people who already claim Christ as Savior. Jesus is inviting his followers into deeper fellowship, deeper commitment, deeper intimacy with him.). And then he waits for us to respond to his voice and to open the door for him to come in. There is no legalism or judgment here. There is simply an invitation and an expectancy that we will respond to him. Now, imagine you are in the room with a group member who seems uncommitted to Christ and to growing in him. Your job is not to answer the knock on the door for him. Neither is it to push him to the door. It’s to lovingly encourage the person to respond and to show him the way by the way you respond to Jesus. Tomorrow I will share more about this grace-filled commitment that we as individuals and groups can make to discipleship. 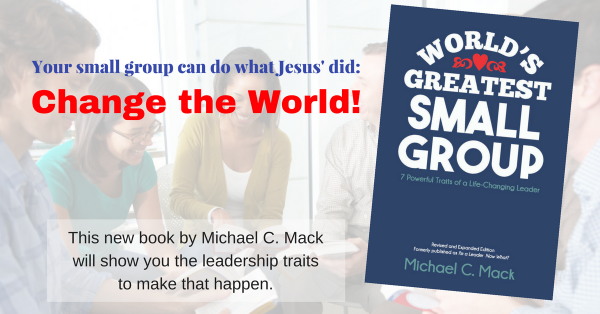 Parts of this post are adapted from Chapter 7 of my book, Small Group Vital Signs: Seven Indicators of Health that Make Groups Flourish. Get your own copy here.